I simply took two RTL-SDR dongles at their max. 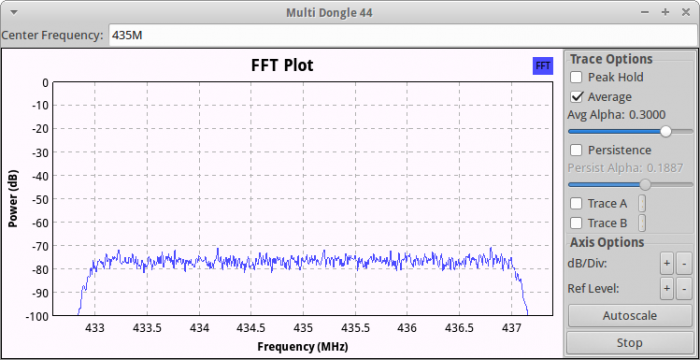 bandwidth of 2.4 MHz, resampled the signals to 4.8 MHz, then shifted the first signal down by 1MHz, the other one 1 MHz up, added them together, divided the combined signal by 2 to lower the noise floor again and finally feed it into a FFT plot. At first, I tried shifting the signals by 1.2 MHz to get full 4.8 MHz , but I realized, that I had a notch in the center, so I reduced the frequency shift until I had no notch anymore. Notice, that this isn’t any useful to decode or demodulate any signals, because of phase and clock misalignment, but it can be very handy, if you want to view a larger spectrum than 2.4 MHz and don’t want to spend money in a more expensive SDR, that can be used at higher sampling rates.